Adapted by Ladislau Vajda, from the “Lulu” plays of Frank Wedekind (1895/1904). One person’s classic film experience is another’s cautionary tale, and even more so when it comes to George W. Pabst’s silent film masterpiece and morality conundrum, Pandora’s Box. For over eight decades, film reviewers have written reams about the sordid tale of sad wanton Lulu, living her life of hedonism, which spirals towards its inevitable tragic end. What is remarkable about this 1929 German classic is that it not only stars American film bad girl Louise Brooks, but that its anti-Semitic innuendos have been ignored by audiences and film critics alike. Fired from Paramount over a salary feud, Louise Brooks, of bobbed-hair fame, turned up her nose at the studio giant and went off to Germany and cinematic immortality. There’s artistry in every movement of Ms. Brook’s Lulu and she appears in almost every scene of this 133 minute restored film. It’s difficult to portray a successful prostitute, murderer, and bisexual playgirl--- and make the audience love you in the process – especially in the 1930s! It was customary during the 1920s to cast the flapper as a fallen woman, partly as a warning to women who were already straining at the bit to define their own empowerment amid the changing times. By the ending credits, our flapper would either give up her wild ways, the man she loved, or die. One reason Pandora’s Box still holds up today is because she brings a modern effortless style to her Lulu, when such authenticity was absent from most silent films. It’s a testimony to this finely-tuned skill, that Louise Brooks is still able to command our attention almost a century later. Another factor is the brilliant cinematography of Gunther Krampf, who bathes Lulu in warm seductive Another factor is the brilliant cinematography of Gunther Krampf, who bathes Lulu in warm seductive whites during the first half of the story. As Lulu’s world begins to unravel, he envelopes her in somber hues of gray and finally, black. that they really are. Her decision not to charge her pick-up - the man who delivers her death - is the final tragic irony, and as the candle flickers weakly, we wonder if she, too, understood it. 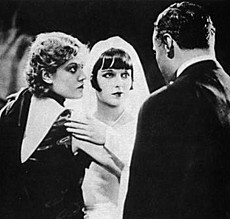 The film's title, Pandora’s Box, comes from an ancient Greek tale of the goddess Pandora, whose curiosity opened a box of evil upon the world. German dramatist, Frank Wedekind, wrote two short plays, Earth Spirit and Pandora’s Box, that were known as the "Lulu plays", and were usually produced as one set piece. Lulu’s world boils down to the narrow confines of her lifestyle choices, which are dependent on men’s generosity and their predictable consequences. Wedekind saw Lulu as a free spirit falling victim to the selfish nature of Man, something that pleased the German Expressionists but failed to impress the censors on both sides of the Atlantic. Pandora’s Box begins in Lulu’s apartment, where two elements emerge: The first is the camera’s eye, moving over Lulu’s living room, quickly sweeping past a menorah sitting on a table. 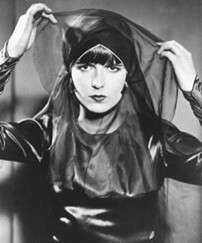 Such a bold reference marks Lulu as Jewish, and that knowledge is paired with the appearance of Schigolch (Carl Goetz), Lulu’s former pimp – who she treats as a surrogate father, “Papa Brommer”. Schigolch is the evil that returns to wreck havoc on Lulu, and his facial features suggests that he is semitic. Pabst spares no small effort to make Schigolch appear amoral, greedy, and dirty; someone who is content to wallow in his own filth and brazenly takes money from Lulu’s purse as she watches – but does nothing. During the pre-war period, such anti-semitic precepts were beginning to find their way into the common forms of enculturation – the universities, mass media, and the creative arts – and would become fully realized by the mid 1930s. In these few moments then, Lulu becomes realized as a female version of the Golem – a moronic monster from a 1920 movie of the same name – who creates havoc with her frenzied sexuality upon the helpless male (Christian) population. When Lulu dies at the hands of a serial killer, tired and only too willing to perish, the question arises whether Pabst was also – on an unconscious level - attempting to warn Jewish audiences about the dangers of passivity. No other semitic references are made in Pandora’s Box, and it’s puzzling how many viewers have failed – on a conscious level – to pick up on these subtle puzzle-pieces that make up this notable film. Maybe this also is a testimony to the talents of Ms. Brooks and the skills of G. W. Pabst. Yet film critics have ignored these aspects, perhaps because to address them means negating a film that is considered a cinematic milestone, much like D.W. Griffith’s, "Birth of a Nation". To truly open G. W. Pabst’s Pandora’s Box means we might just discover another classy piece of propaganda from a closeted anti-semitic artiste. Be warned that the 2006 Criterion DVD release has an annoying soundtrack, which only serves to distract from the viewer's enjoyment - a practice that most silent film soundtracks continue to suffer from - so watch Pandora’s Box with the sound muted. 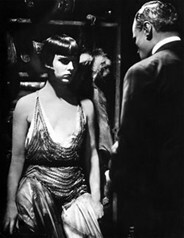 *1 From Pabst and Lulu, by Louise Brooks, for Sight and Sound Magazine, 1965. "The Sitting-Room, where Lulu seizes Schigolch and they spin each other right round with childlike exuberance. Lulu stands back smiling proudly, her hands on her hips, so as to show off the beautifully furnished room. Schigolch, leaning on the mantelpiece and taking off his gloves, looks round at it all with a certain scepticism. She laughs, exasperated. It is as if he hasn't understood. 'It's mine!' she seems to say, clutching her hands to her breast." A short sketch of Schigolch states only, "a shabbily dressed man", "little old man in the baggy suit and worn, greasy hat", "presumed beggar". *3 Pabst and the Social Film, by Harry Potamkin, originally appeared in Hound and Horn Magazine in 1933. *4 The Golem was a film from the Weimar Republic pre-war era. Taken from a Jewish fairy tale, the Golem was a creature born from dust and magic, formed to protect, but ultimately destroys everything in its path. Third Reich propaganda minister, Goebbels, gave the film’s director, Paul Wegener, a commendation for his cinematic efforts during the Nazi rule, perhaps because Hitler looked upon Wegener’s Golem trilogy as an anti-semitic message that should be rewarded. *5 Early Greek mythos saw the creation of Pandora as literally the first woman on earth, and given that her name meant "all-gifted", this would suggest that she was originally a fertility goddess, as the playwright Aristophanes describes her as, "...Pandora, the earth, because she bestows all things necessary for life". (The Birds, line 971) Later patriarchal interpretations would see Pandora as a harbinger of all the world’s ills, suggesting that the Greek goddess was the forerunner of the bibical Eve. In Lulu, Wedekind saw a tragic etheral creature, brought down by society’s hypocrisy and lascivious greed. * 6 Auteur is the French word for author, as in the director creating a film with his own personal message or perspective. Original essay by Paulette Reynolds, 2011, for Outside Hollywoodland.com.